Firstly, I really do live in a log cabin outside the small town of Tomball, Texas, just north of Houston. Our cabin is surrounded by thick woods inhabited by white tail deer, raccoons, rabbits, possum, armadillos, pheasant, and even the occasional coyote! It truly is a pleasure to live, work, and raise our family here. I made my first quilt 35 years ago, but really became obsessed with quiltmaking in the past 25 years. I've completed over 130 personal quilts over the years, and by necessity, was forced to move from handquilting to machine quilting in order to keep the tops from piling up. I began machine quilting, for myself and others, on my domestic sewing machine, but after years of wrestling quilts through the small opening, I decided to expand my horizons by investing in a Nolting Pro24 Longarm. I've taken scores of piecing, applique, and design classes over the years with renowned quilters such as Pat Campbell, Cindy Blackberg, Jinny Beyer, Karen Combs, Cindy Walter, Jan Mullin, and many more. I've taken classes in machine quilting with Linda Fiedler, Mary Eddy, Carol Thelen, Karen McTavish, Linda Taylor, Dawn Cavanaugh, Christine Olson, Pam Clarke, Claudia Pfeil, and Irena Bluhm. 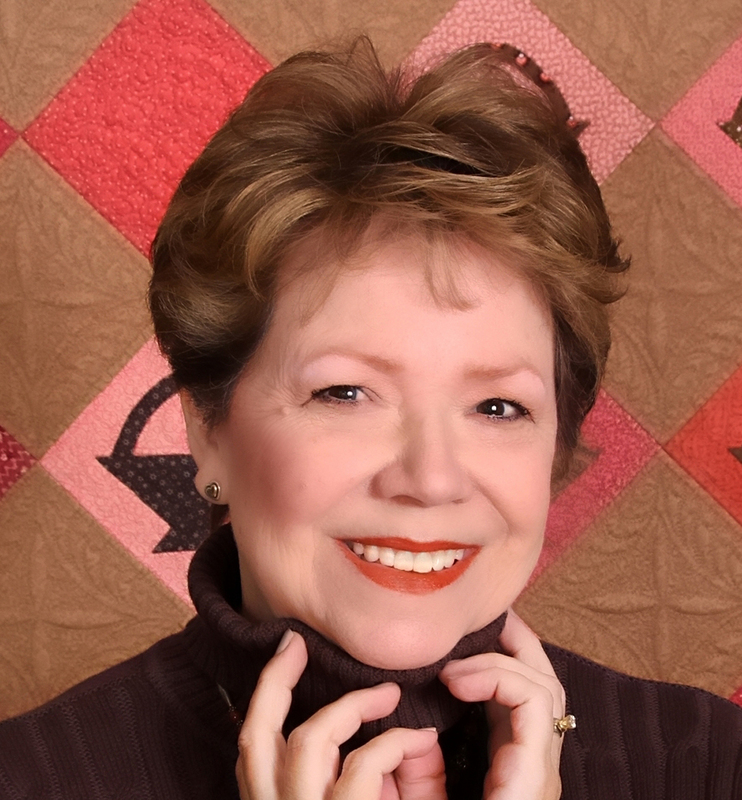 In addition, I've taken classes in quilt dating, judging, restoration, and appraisal with renowned experts, Dixie McBride and Bobbie Aug.
To request a color brochure, please click on "Contact" at the bottom of the page. * Choose a 'busy' print - Since the thread color will be chosen to enhance the quilt top, you should choose a backing fabric that is 'busy' so as to hide the starts and stops of the quilting. Having a pastel top with pastel quilting/bobbin threads, combined with a navy backing fabric, will result in a back that looks like white crayon on black paper - not too attractive. I stay away from different colors in the top and bobbin, as it's easy to see tiny changes in tension when going around curves - these show up as little pin-dots on either the top or back of the quilt. * Choose good-quality fabric - Use the same type of fabric you used to construct the top. Sheets are notoriously difficult to quilt through. Their high thread count and tight weave make it difficult to keep a consistent tension, and can also result in tucks or pleats. For this reason, I do not accept sheets as quilt backings. Important: Be certain the amount of backing you send is adequate! Add 8" to both dimensions of the quilt to determine the amount of backing needed. Excess batting and backing at the end of quilting (over 2" in width) will be returned to you. * Using a wide-backing fabric is more economical than piecing 44" yardage together. Primarily I use Superior and Signature threads, in cotton or cotton-covered polyester, in either solid or variegated, depending on what the quilt needs and the look the client wants. The top and bobbin threads will be the same color, with the exception of monofilament - then the bobbin thread will match the backing fabric. There is no charge for thread, unless the client asks for a specialty thread such as metallic. What is the "Turn Around" time for a quilt? Currently I have a 6 week waiting period from the time you reserve your quilt's spot to the date I begin working on it. I ask that the quilt be mailed or dropped off 2 weeks prior to your reservation 'date' in the event that I can get to it sooner. It will be returned as soon as it's finished, and payment in full has been received. Of course, the sooner you contact me, the sooner your name goes on the calendar! There is a non-refundable $25 reservation fee, to hold your spot. It will be applied as a credit to your final bill. What kind of battings do you carry? * Hobbs Heirloom 80/20: 80% unbleached cotton & 20% polyester; lightly needle punched and lightly resin bonded. 1/8th" + loft. Can be quilted up to 4” apart. Machine washable with shrinkage of 3-5%. * Hobbs Polydown: 100% polyester, the ultimate polyester quilt batting. Resin bonded to resist fiber migration, non-allergenic, 1/4" loft. Can be quilted up to 4-6” apart. Machine washable, no shrinkage. * Hobbs Wool: 100% resin-bonded wool. Wool breathes better than other fibers and acts like a natural insulator helping to maintain comfort in summer or winter. Can be quilted up to 4” apart. Machine washable, with little shrinkage. This batting is incredibly light - a quilt utilizing this batting is unbelievably lightweight. It costs a little more, but the drape is beautiful. 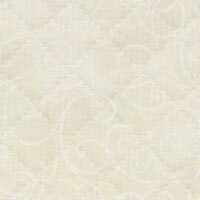 * Hobbs Heirloom Organic 100% cotton, needlepunched without glues or resins. Can be quilted up to 10" apart. Machine washable, with 3% shrinkage. It's similar to Warm & Natural. May I supply my own batting? Yes, providing it is of the same high-quality as the battings I use, is low-loft, and is at least 8" larger in both width and length than the quilt top. Under no circumstances will I accept a Mountain Mist batt. They are too flimsy. Any others, email me with the product information from the package and I'll tell you whether or not I can use it. What do you mean by 'basting'? I will machine baste your quilt on my longarm, at about 4" intervals, using a neutral-colored 100% cotton thread. It will be returned to you ready to be handquilted. No more strain on your back and knees! Do you trim the quilt before returning it to me? Unless otherwise requested, I normally trim around the perimeter of the quilt leaving a generous 1/2" beyond the quilt top. That gives you something to grab on to when applying your binding, but still gives you a presentable-looking quilt for guild show & tell night, even without the binding. I will, of course, return all the trimmings to you, providing they are at least 2" wide. * Tops should be pressed, and all stray threads clipped. Be sure your quilt is 'squared up' - that is, the corners are 90* angles. * Borders that are 'wavy' with too much fabric for the length/width of the top, can result in puckers or fullness in the finished quilt. See Adding Borders on the How-To page. Removing and recutting a border at this stage will make you much happier with the final quilt. * Please indicate with a note attached by a safety pin which edge of the quilt top is the "top" in the event the quilting is directional in some way. * Backing fabric should be pressed, 'squared up' (90* corners) and at least 4" larger than the top on all four sides. That is, 8" larger, both vertically and horizontally, than the quilt top. Remove the selvedge edges - they can cause pulling and puckering. Please don't use sheets, as the weave is usually too tight to give a nice stitch when quilting on the longarm. * If providing your own batting, it, too, must be 'squared' with 90* corners, and at least 8" larger than the top, both vertically and horizontally. * All three layers will be loaded separately on my longarm, so don't baste anything together. Add Borders: To avoid having quilts that 'wave' at you, be sure to measure and apply your borders correctly. Measure from the center of one side of the top, across to the center of the other side of the top. That is, not along the outside edge from corner to corner. Better still, take three measurements and average them to find the cut measurement for your border. Cut two lengths of border material and pin to the opposite sides of the top, matching the outer edges and center. Pin to ease in any fullness that might exist. Stitch, press, then repeat the process for the remaining two sides. Piece Backings: Measure the length and width of the completed top, and add 8" to both measurements. This will be your finished backing measurement, with sufficient extra fabric all the way around so as to make your Longarm Quilter love you. Remove the selvedges, as they are more tightly woven, and might give you problems later. If you find it necessary to seam your backing, sew with a 1/2" seam allowance and press it open. You might consider sewing that seam with a very small zig-zag stitch to help it 'give' a little if necessary. One seam down the middle is ok, but consider that folding and refolding over the years might cause the fibers to weaken. A better alternative would be to make the backing out of three pieces of fabric. An easy, no-math way to accomplish this is to place two lengths of backing fabric, right sides together, and sew vertically together along the 2 outside edges, to form a tube. Then cut right up the center of the top fabric only, and open out the two new 'side flaps.' Trim these along the new outside edges, so the backing is as wide as you need. You might have enough trimmings left over, that can be used for binding. Stabilize Edges: If your quilt has pieced borders, please stabilize the edges by stay-stitching 1/8th inch all the way around the top. This will keep all those loose seams from wiggling apart during the quilting process. If your backing is heavily pieced, I would recommend stabilizing it, too.